If you’re interested in advancing environmental, economic and social justice, then join our team of student stewards and fellows who work with Sustainability Office staff to promote UC San Diego and University of California sustainability goals and initiatives. UC San Diego Sustainability is seeking student volunteers to work at the Sustainability Resource Center. Volunteers will assist the Sustainability Program Coordinator and team of volunteers with promoting the campus sustainability goals, initiatives and projects, including the new Sustainability Ambassadors Program. Sustainability Stewards will assist the Sustainability Resource Center Manager and student interns with initiatives and projects, such as Green Office, Green Labs, marketing and events. UC San Diego Sustainability Volunteer Opportunities are CCR Approved! 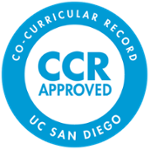 CCR, or Co-Curricular Record, recognizes the work students do outside the classroom by recording the experience on an official document that accompanies the UC San Diego transcript. Students who volunteer for 30+ hours during the 2018-19 academic year with UC San Diego Sustainability are eligible for this program. Learn more about CCR. To apply: Send a letter of interest describing your qualifications and experience related to the position, and a current resume to Jennifer Bowser, Sustainability Resource Center Manager. The Sustainability Ambassadors Program is a registered campus student organization sponsored by the UC San Diego Sustainability Office and the UC Office of the President’s Carbon Neutrality Initiative. This program aims to educate and engage students through peer education and programming to raise awareness of UC San Diego’s efforts to reach carbon neutrality and encourage students to implement sustainable living methods. Volunteer ambassadors will work under the direction of the Carbon Neutrality Initiative Student Engagement Fellow and the Sustainability Program Office. Ambassadors will be trained to educate other students on sustainability issues through workshops, projects and social media engagement activities at the Sustainability Resource Center. Each Sustainability Ambassador will become knowledgeable about the Carbon Neutrality Initiative (CNI) and focus on informing and engaging students on personal, campus-wide and global changes that can be made to reach CNI goals. Six ambassador positions are available for the 2018-19 academic year. Application deadline: Submit the online application by Oct. 5, 2018. If you have questions, contact UC San Diego Sustainability. The UC President’s Carbon Neutrality Initiative Student Fellowship Program funds student-generated projects that support the UC system’s goal to produce zero-net greenhouse gas emissions by 2025. Students selected to serve as the campus CNI Student Engagement Fellow will work with Campus Sustainability Staff to communicate about campus and UC‐wide sustainability goals and programs, to assess existing programs and efforts, and to engage undergraduate and graduate students in those efforts. In addition, engagement and communication efforts should enable and empower students to provide feedback about campus and UC‐wide sustainability programs. The 2018-19 application period is closed. The UC President’s Global Food Initiative Student Fellowship Program funds student-generated research, related projects or internships that focus on food issues. The program is open to undergraduate and graduate students, and is administered by Campus Sustainability Staff to ensure that student efforts align with local needs. For more sustainability-related employment and volunteer opportunities, visit our blog.